Lagalog Philippines Travel Photography Blog: Good morning Borongan! The sun begins its ascent earlier during this time of the year. As the yellows and reds take over the blues, there are some of us already up and about to witness the transition from dark to light, cold to warm. While i have to get a headstart on the sunrise perchance to capture the fleeting moment of the night surrendering to the morning, Manong here gets a headstart on gathering wood for fuel before the day gets kindling hot. 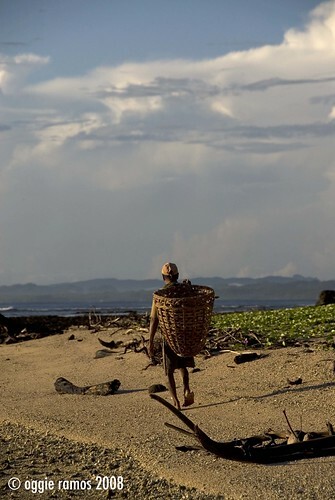 I'm sharing this sunrise capture of a wood gatherer in Divinubo island off Borongan, Eastern Samar in lieu of my selected takes until the Seair InFlight issue comes out in december. Just another day, another sunrise on the deserted side of this lovely island. Travel info: Divinubo Island is 30 minute-banca ride away from Brongan, Eastern Samar; one can ride a banca from the town of Lalawigan, roughly a 20-25 minute drive from Borongan City proper • Accommodations: very popular with the locals for its proximity, it has huts for day promenaders and cottages for overnighters • views & Recreation: the lighthouse on the eastern flank has an expansive view of the Pacific. The shore is lined with rocks and karsts, making the island unsuitable for surfing but great for swimming and snorkeling (and of course, photography)• Power: Electricity is available on a fixed schedule so be prepared with fully-charged cameras or gear. beautiful photojournalism. i salute you. you're terrific. thanks photo cache :-) my pleasure to share whatever is on my b-sides. more to come december. ganda ng kuha na to oggie. nagmatch yung kulay ng basket, ng balat ng tao at ang sand. Love your pictures! It's amazing how 1 shot can say a thousand words! by the way, I linked you! dom, that's really the beauty of the golden hours of the morning. the tones are really something else. thanks for dropping by bro. mukhang maganda talaga dyan ha. kwento mo palang at wala pa yung a-sides na photos eh natatakam na ko mapuntahan yan. I think you need to size your picture a little bit bigger before posting it. It appears a bit pixelized on my screen. But it is perfect when I click on the picture and I get a smaller image. hi sidney. hmmm, will look into it. i've viewed this on my home computer and here in the office and i seem to be having no problems with it :) thanks for viewing. i really want to share more but this would have to wait until the inflight issue comes out first week of december.